It's going to become a theme week after week for the rest of the season but Sunday's match-up between Ohio and San Diego is a must-win for each side. 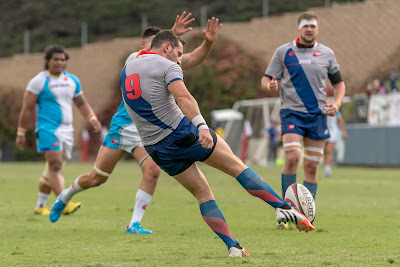 With Denver firmly at the top of the table with a perfect record the 3-3 Ohio Aviators and the 4-2 San Diego Breakers can't afford to drop any more points if they want to challenge Denver during the second half of the season. That is especially true for Ohio seeing as if they drop below .500 they are all but out the rest of the way. Impacting each team going into the match is the number of players missing on international duty. San Diego are missing their entire front row either to the U.S. or Canada as well as several key players in their backs. Ohio are missing less players but they are missing players that have been crucial to their success so far this season, including Angus MacLellan and Kyle Baillie. How well each side can adapt to these absences and show depth is going to go a long way to helping them pull out a win. If each side was at full strength there aren't a lot of differences between the two, however, with the absences it throws off the balance. Hubert Buydens, Jake Ilnicki, and Joe Taufete'e have been coming on well over the last few weeks since the introduction of Ilnicki but they are all gone. In their place come in Mason Peterson, Mike Sosene-Feagai, and Epi Kalamani. Sosene-Feagai has good experience while Peterson is fresh off his All-American experience and has been impressive for a young player. That said, they are coming up against a very front row in Jaime Mackintosh, Dylan Fawsitt, and Demecus Beach. It would have been even more solid if MacLellan were on the team. If the Ohio front row can earn penalties at the scrum they can click over the scoreboard. For San Diego it's about keeping things even and giving the rest of their team a chance. San Diego are also missing a number of their backs, including Phil Mackenzie, Mikey Te'o, and Taku Ngwenya. All three of those players have been fantastic in recent weeks and will be missed. Even though those players are gone they have good replacements in Ryan Matyas, Pono Haitsuka, and Kalei Konrad. Matyas slide in the centers with Andrew Suniula while Haitsuka is on the wing with a recovered Stanfill. Konrad gets the nod at fullback. Ohio have undergone some changes in the backs themselves but with an eye to improvement. Robbie Shaw gets the nod at scrumhalf while Taylor Howden will start at fly-half. Howden has been excellent for the Denver Barbarians in the past but will be needed to take a step forward even more against San Diego. Matt Hughston steps in the centers along with Dominic Waldouck. Hughston has played plenty of center in his career while Waldouck brings lots of foreign experience. Where this match may turn is with the kickers. It's expected to be warm and muggy and even though the fitness of the teams has improved it's going to take a toll and some players might make mistakes. We all know that Kurt Morath can kick and pick up points. More, it's going to be up to Howden, Shaw, or Shaun Davies, if he comes off the bench, to make that effort. Outside of the kickers key players that could make the difference include Sebastian Kalm for Ohio and Sione Tuihalamaka for San Diego. Kalm has been the leading try scorer this season and has done that by finding himself in the right spots at the right time. Tuihalamaka has been one of the surprise players this season who has only gotten better as the season has progressed. With some players gone he'll need to step up to an even bigger role. It's going to be close but we think the front row of Ohio is going to make a difference. You can tune in at 3:00 p.m. et/12:00 p.m. pt on prorugby.org or One World Sports.